Lessons for Kendo. $3 and this lasts for 30 minutes or how many people or in the class or attend. You get your own wooden katana as well as gloves. Attire for lessons being either in a kimono or jogging attire. 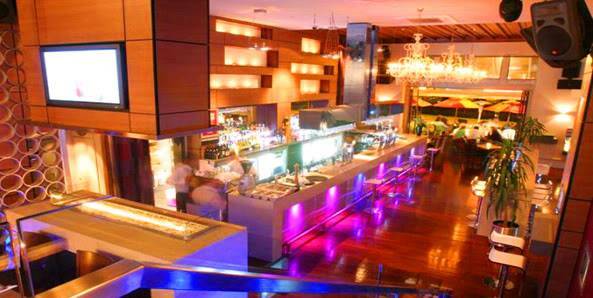 Kyuzo entered his bar with his eyes closed, he had his clothes on which seemed to be of that of bartender clothes. He was going to work all alone even if it killed him, Kyuzo had feelings to get rid of and so he will do everything possible to get rid of them. Turning on the lights of the bar, Kyuzo picked up a Tv remote and turned the Tv on inside the bar. Walking along with his arms crossed, Kyuzo placed the remote down on the bar counter and took a seat in the back. Pulling out a cigar, the blonde haired man placed it into his mouth and lighted it with a lighter. Kyuzo had a faint irk mark over his left cheek for he was feeling upset in both ways, one was anger and the other was slight depression. Families were nothing but trouble, Kyuzo should of known that when he was younger. Besides, back then he was a stupid immature boy. Kyuzo took the cigar out of his mouth with his right hand and looked up to the Tv with a blank expression. "Sports isn't really my thing." Kyuzo changed the channel and found one that suited his interest, it was a cooking channel and he had to up his game in making food. After sometime of watching the Tv he had come to realize that he called himself stupid and immature and now he was older and had a bit more experience. Just the thought of himself calling him old placed more irk marks about his face. Kyuzo placed the cigar back in his mouth and as he did this poured himself something to drink. A small amount of alcohol which of course was sake in his standards and he himself paid for the drink, Kyuzo was both drinking silently as well as smoking hoping to get rid of his so many flaws. A little white cat mewed happily as she sat on top of her master's head right between where his black cat ears would have been. They were hidden in his hair which had grown long enough to be pulled back with clips at the back of his head. He had yet to put it together in a ponytail but he was sure to cut it before it even made it that far. The neko had his tail wrapped around his abdomen inside his shirt and of course wore nothing but a gothic black and gray attire. Mori Triedto ignore his kitten's pleas as she saw the familar Bar/Kendo she had snuck into the previous time they were thereyet the mewing continued unrelentingly. 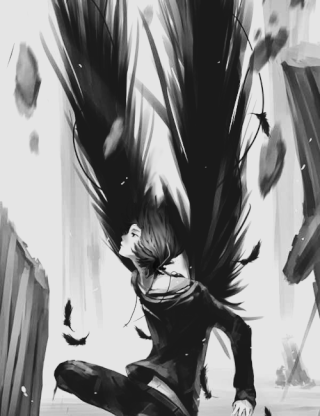 Mori sighed and looked to the door, seeing it was open, might as well go see and check how Kyuzo was doing. The neko walked in and checked the Kendo division before registering it to be empty then glimpsed inside the Bar, his hand rising to his shoulder where a katana had been strung across his back, held inside a clothed bag. Kyuzo let out a puff of smoke and after doing that did he hear his name being called, his expression became blank but he did close his eyes and smirk. Due to him wearing sunglasses it was hard to tell if his eyes were open or not but he did not let that bother him much. "Mori-san, what brings you here?" Kyuzo placed his right hand up to his mouth taking the cigar out of his mouth for the time being before looking to Mori. Since his sunglasses were in the way he placed his head down lightly so Mori could see his eyes. Kyuzo has stopped his drinking for the time being as well as letting a moment of smoking go by without a care in the world. Kyuzo was a little curious though he wasn't going to ask why Mori was here until later on when the time was right. Mori's nose twitched then wrinkled at the scent of smoke and he turned his head to the side while raising his hand to cover the lower half of his face so he could cough to himself. He nodded a simple greeting to Kyuzo before glancing up to the kitten on his head who didn't seem to be too disturbed by the smoke hanging in the air but also seemed to purr a small hello. The neko walked in further, now more confident in visiting since he was still reluctant being in a bar. He looked to the glass of sake and raised an eyebrow but did not futher any questions. "Nothing, really. I just wanted to visit and see how you were doing." The neko's hair was now rid of the horrendous black and was back in its shaggy dark shade of black as were gone with the disgusting red contacts he had been wearing while Nana had been in his charge. It looked completly normal like before except for the small exception of his hair being longer and clipps up and out of his face save for his bangs. "Been enjoying yourself, have you?" The boy said giving the cigar and glass a small wave of his hand and he looked to Kyuzo for a moment before turning his head away to cough once more. Kyuzo blinked as if picking up on Mori's discomfort and he pushed the cigar into the ashe tray right near him and he killed the flame. "iie, [No,] I have been kind of feeling bad for the past few months. Just trying to get rid of the feeling. Other than that I am hanging in there and taking it easy." Kyuzo looked to his empy glass which had the sake in it from earlier and as he picked up the glass he placed it in the sink right behind himself and the counter of the bar. The blonde haired man made a silent noise of awkwardness. Kyuzo felt sort of better though he still felt a little bad, but he let that pass as he looked to Mori kind of blankly. Mori watched as Kyuzo put out the cigar and couldn't help but breathe a small sigh of relief before taking a seat at the counter, his ears popping up from hiding in his hair and his tail slipping out of his shirt and curling near the end slightly wagging but very slowly. He frowned slightly upon hearing that Kyuzo hadn't been doing very well for a while and he grew a bit concerned. The small kitten mewed and Mori removed her from his head and set her down gently on the counter with him. She trotted around in a circle before looking back to the black haired neko and wagging her tail much like a dog which made him frown at her too though she just mewed that optimistic meow of her. Kyuzo had been sitting for quite sometime in his stool and hearing what Mori asked made him sigh and swiftly enough he took off his sunglasses showing his face. His features were quite the opposite of what he was feeling for though he was blank his eyes said it all, Kyuzo found out somethings which were better off not knowing. "My sister died not to long ago, if anything I found out that she had come to have passed away peacefully in her sleep. That was a week or so ago." Kyuzo looked toward the sink and he bit his lower lip for he seemed to be tense and not know what he could do to get rid of such horrible feelings. Probably working wasn't the best of ideas to get rid of such a horrible feelings, Kyuzo though didn't think about it to much and his facial features returned to just being rather blank. "I am pretty sure she is peaceful, and now I am going to try my best and live on for her for that is the least I can do. Enough about me." Kyuzo looked to Mori and it was like he had come to notice he was back to normal and that made Kyuzo very glad. "Lets hear about you, Mori-san. I see you are back to being yourself. That makes me happy." Saying it was the only thing that Kyuzo could do though he did come to smirk, of course he didn't forget about Mori's ordeal and so he decided to not pry into Mori's buisness for that wasn't right. Mori blinked and curled his tail around his legs where the curled end now laid softly on top of his shoes. His ears lowered and his frown disappeared as he bowed his head. Kyuzo's sister had passed away and right after Kyuzo had been disinherited. Mori didn't know much on families and such, not quite used to the normal thing as it were. He knew it was bad and horrible he would have felt if his brother had passed. Yet Kyuzo didn't seem to be wanting to focus on that much. He tilted his head and brushed his fingers lightly against his black hair not quite messing with the clips. He playfully frowned once again and moved his hand to his kitten, dragging her away from the ashe tray. "What? You didn't like my white haired look? I'm offended Kyuzo~Kun." Kyuzo blinked once before he chuckled with his eyes closed for it was as if the blonde haired man was not at all feeling bad about what Mori had come to say. He knew Mori well enough or so he had come to thought. "Mori-san you are fine just the way you are. Your hair doesn't change the fact that you are still the same." Kyuzo placed his sunglasses in his pants pocket on the left hand side and he seemed normal. Opening his hues he looked toward Mori's pet and he watched the cat be a bit of a pest. Kyuzo didn't see anything wrong with it though, everyone was a pest every now and again in both ways. Mori smiled and chuckled softly, almost silently, his ears perking up on top of his head once again while he looked down to the kitten as she purred even if she was not being petted but she was getting attention. The neko huffed at her crossly but she still remained to be in that happy mood of hers. He smirked to his friend teasingly and snickered quietly. "Aw~ Its nice to know you think that, Kyuzo-kun." The kitten mewed again and started pawing at the string that hung off of Mori's sleeve, his small claws catching it. The neko twitched his ears which were still pointed to the sky and slowly began to move his hand away across the counter, dragging the kitten along just as slowly while she mewed. Kyuzo nodded as if saying that he was glad that Mori liked his words of honesty, though he had come to look to the feline and he watched it almost blankly to it being drug along. "Strange." Kyuzo said this rather slurred and not at all impressed though he was slightly interested. Rubbing his chin lightly he came to stand up and turn his Tv off, Kyuzo then looked to Mori and remained silent as he looked to him. A lot of things have been happening now and he knew it, Kyuzo was a man that comes to know when to many things do come to happen. "Mori-san, I do mean it. I am glad to know the real you, and if I were lying then chances are I would feel much more horrible." Kyuzo felt much more feelings than others, and calmly he left the bar counter for he guessed he was there long enough. Walking past Mori he patted his head and said rather relunctantly. "Gomenosai." The reason for this answer was uncertain even to Kyuzo, the one speaking it. Mori twitched his ears, chuckling slightly to the kitten, finding her amusing for the moment before placing his hand over her once again to get her to stop. Her small mews from under his small hand made him smile, no matter what he did, she always mewed so happily. He pets her head as he looks to Kyuzo, hearing him mutter something about the kitten and didn't say anything about it because he often got those kind of comments from people who watched the two felines. 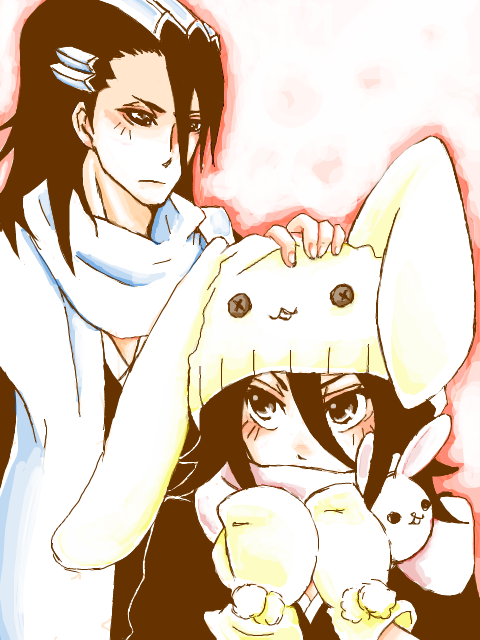 The neko grew confused though as Kyuzo patted his head and apologized. What for, the boy was unaware of and he came to frown fully as he looked to Kyuzo. "Is something wrong? Your acting strange. Something on your mind, Kyuzo-kun?" Kyuzo seemed to chuckle and after he chuckled he looked to Mori and though he was blank in some small emotions, the strong ones still were able to peek through. "Nothing really is on my mind, just a little light headed. Though I doubt I have drunk that much." After saying that, Kyuzo ended his chuckle and wrapped his arms around Mori's shoulders with his eyes closed. "Then again I am saying sorry for all that you have been through." Emotionally, Kyuzo still felt bad for he never got to see his sister one last time but he decided to think past that and if anything give a little comfort to Mori. Though, he was certain that Mori didn't need it. Mori twitched his ears, both lowering uncertaintly as he was hugged by Kyuzo. He flicked his tail off of his shoes and blinked once, slightly confused but removed his hand from the kitten to poke Kyuzo's forehead as he smiled. His friend really was acting strange, the hug was comforting but Mori had been feeling normal for a couple of weeks now especially after having Nana return home with her father who had finally made an appearance. "Tsk, Tsk, Kyuzo-kun. You shouldn't drink too much, you get all cute and clingy." Mori snickered slightly, teasing his friend with a small jest. The boy's ears twitch and he smiles up to his friend in an innoccent manner. He curled his tail and tilted his head lightly, not bothered by Kyuzo's somewhat drunken manner. Kyuzo seemed offended though he chuckled it off as he shook his head and after shaking his head did he say sort of honestly. "I am not drunk. I need to at least drink another cup of sake to get drunk." Taking his arms off of Mori he still looked down toward Mori and his innocent face and he raised a eyebrow to his teasing. Blinking his eyes once or rather more on the terms of twice did he do what he had come to do when they had first come to meet eachother. Kyuzo placed a kiss on Mori's forehead and turned away with his eyes closed and doing a rather sharp 'Hmph.' noise. After doing that though did he looked over his shoulder toward Mori as if expecting a reaction. Mori snickered to himself silently as he heard what his friend said about needing at least another cup of sake to actually be drunk and he poked Kyuzo's forehead once more for good measure. Its not like only after having one cup of sake that you couldn't get a little drunk. The neko blinked as he watched Kyuzo watch him after leaving his arms around his neck and instead had come to place a kiss on his forehead which reminded Mori of the other time that Kyuzo had done so. The boy raised an eyebrow though not quite so noticeably since he could see that Kyuzo seemed to be waiting for something and he snickered to this. The neko pretended to be shocked and held a hand on his forehead. The white kitten mewed and noticed something nearby, she slowly crept to it and pawed at the strange looking thing. It would seem to be some sort of...oh, it was Master's katana he had set down. Usually, he wouldn't do so unless it was a comfortable place. The kitten mewed again and pawed at the cloth. Kyuzo chuckled and if anything he looked to the side and then looked to Mori and he had come to think that he had become blonde for nothing. It maybe better for him to return what he would come to normally look like and that was a choice that he would come to have to change on his own. Shaking his head silently, Kyuzo knew that Mori was playing along and he looked away before asking. "Mori-san do you miss how I use to look like?" Since he wasn't in the family anymore it would be better to be himself rather than continue hiding himself. Mori stared slightly at the question that popped up and looked to Kyuzo's blonde hair. That's right. He dyed it blonde because his family had wanted it that way. The neko grew confused because in all the time that he had known Kyuzo was when he had had black hair that was casually thrown into a ponytail and sometimes allowed to flow freely down his back. Now it was cut short and blonde, dyed to a much lighter color. Mori was sure how to make it out but the blonde suited his friend. It brought out his true personality of being a optimistic man on the inside. Darker hair was for jaded people, people like Mori. The thought seemed to bring a shadow over the young boy's face and he wore a small smile to cover it up. "At times, I do remember how your hair used to be. It is your choice but I hope you will consider this. Your not the person you used to be. No one can change back after what you've been through. You can either go back or maybe change your appearance, but it will not change who you are. Not again." Kyuzo seemed to be thinking about it and h touched his hair, he had come to be blonde haired for sometime but that was true for he was still the same as he was. Kyuzo sighed and he looked upward in a glance before covering his lower half of his mouth for he didn't have to be blonde anymore and so he walked away toward the back. Kyuzo had stepped into the dojo and he smirked for he felt optimistic for it was about time to change back and surprise a few people. "Mori-san, I am free and so I will turn back to my natural look. Afterwards, who knows." Kyuzo walked to the side toward the locker room to change into a kimono, but sometime or another he may return to being blonde much like how he is now. Mori curled his tail and nodded as he let out a small chuckle before looking to his kitten and frowning. The neko gently grabbed the kitten's tail and pulled her away from his katana, knowing the young ones knack for knocking things and breaking them. Mori smirked and laying his head down on his arm which rested on the counter in a comfortable manner. "Nya~ If you say so." Mori petted the kitten despite the treatment it had recieved. The little white ball of fluff mewed and purred at the affection before curling up next to her master's hand and mewing once more though quietly. 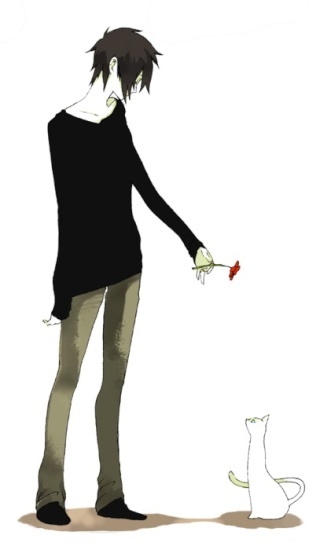 The neko petted the kitten across the head gently with one finger as he waited for Kyuzo to make a reappearance. Kyuzo stepped outside this time with a wooden katana and he placed his hand up on the door, his eyes were gray back to their natural color. "Come." Kyuzo was going to practice with his kendo skills and if anything he was going to practice with Mori for he seemed bored at the moment. Actually feeling good to being to his natural self made Kyuzo feel a little bit more confident and if anything he began practicing his skills of balance first before actually doing the other thing of doing kendo. Kyuzo had his eyes closed as if trying to do it without using his actual vision. Mori twitched his ears, blinking for a second in confusion before catching the man going into the Kendo part of the shop. The neko, catching onto the idea, grabbed his sword and the kitten setting her on top of his head again as he made his way over to the Kendo Dojo right after Kyuzo. He glanced over at his friend and smirked before setting down his katana on the ground near the wall and setting his kitten on top of it. The cloth was thick so it wouldn't feel uncomfortable if the little kit stayed there. Mori flicked his tail and fetched a wooden sword of his own, his ears twitching in anticipation. Kyuzo looked to Mori and he smirked before fully grinning with his eyes closed. "Are you ready, Mori-san?" Getting into position he placed his katana up by using both of his hands, Kyuzo's smile left his face though however. "Lets make this interesting as well while we are at it. If I win, you got to do chores at my apartment for a week." Kyuzo was only playing around then again it was good to put up bets for it may make the time together much more interesting. "What if you win, what do you wish for me to do for you?" His body posture was calm, Kyuzo wondered what Mori would come to say for his little bet. Mori smirked and took his place across from Kyuzo, holding the wooden sword with only one hand for now which was his dominant hand, his right. He slightly pouted at the word chores and it only deepened as he heard the time length. The neko twitched his ears slightly, wondering what he should ask of Kyuzo to do if he won. He could clean his own place, do his own chores. What would use for Kyuzo to do them for him if Mori instinctually did them himself. He cooked for himself which surprised many people and he liked keeping his place clean and tidy. The neko shrugged his shoulders and smirked, changing his posture as he held the wooden sword with both hands in front of him. "What have you to offer? You can surprise me at the end."